In what can only be described as absolutely appalling weather conditions Adelaide’s Rhys Newman again demonstrated the skill and tenacity in the wet he has shown so many times before to take a podium second place for the 6th and final round of the Victorian Country series on the weekend. Held at Portland’s Yarraman Park circuit on coastal Victoria the podium finish in the event also cemented second position in the series for Rhys. “Mathematically we believed there were 4 potential winners of the series competing here today” said Rhys, “so we knew it was going to be a tough fight, the weather just made it more interesting”. Over 30mm of rain fell from the Friday when controlled practice started until the Sunday when the organisers took the decision to cancel the meeting after only two of the three races had been run, heat one on Saturday and heat 2 on the Sunday morning. During one practice session blinding hail reduced visibility down to at one stage only metres! “You could certainly feel the hailstones through the gloves” grinned Rhys after the session. The series was contested over 17 races and hosted at 6 circuits throughout western rural Victoria starting in February early this year and visiting Ballarat, Horsham, Cobden, Warrnambool, Hamilton, and finishing at Portland. “This is certainly a tough series” said Rhys. “I have enjoyed leading the series during the year and the season long battle, to finish a close second against the caliber of competition on our first attempt of this series is very rewarding” he concluded. The event presentation was followed by the series presentation on the Sunday afternoon. On the podium Rhys thanked his engine builder and long time supporter Ian Williams along with his chassis supplier Kym Pearce from Omega Race Karts. Fathers had no problem putting his power to the ground with 4 pole positions and 9 race wins over the course of the series. Fellow Adelaidian Rhys Newman also has reason to be pleased; he has finished the series in second place in the Junior National Light class. The two students have travelled together for the series which was contested over 17 races and hosted at 6 circuits throughout western rural Victoria starting in February early this year and visiting Ballarat, Horsham, Cobden, Warrnambool, Hamilton, and finishing at Portland. Fathers and Newman were the only 2 Adelaide based South Australians to contest the entire series. Mt Gambier Student Stefan Millard was the only other South Australian to contest the entire series finishing second to Fathers in the Clubman Light class. “I’ve really enjoyed this series” said Fathers” I’ve made a lot of friends and experienced some great racing at tracks I’ve not visited before”. At the series presentation held at a rain shortened Portland, both drivers thanked their respective engine builders: Fathers thanking Grant Lindstrom from Pro-Karting and Newman Ian Williams from Ian Williams Tuning. 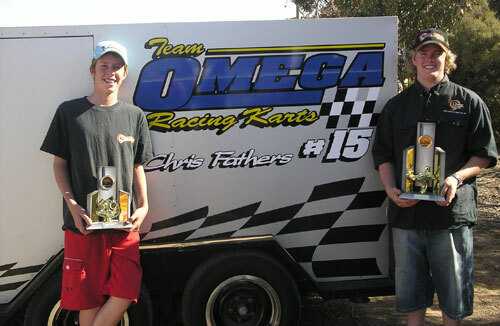 Both drivers also thanked Kym Pearce from Omega karts for the chassis they used throughout the series. Fathers contested the final round at Portland in a Monaco chassis.